Born and raised in France, sub-contra bassist Yves Carbonne started learning classical piano at age seven. His career on electric bass commenced when he was 13 years-old, and two years later, he began playing the acoustic upright bass. Upon hearing the music of bass icons Stanley Clarke and Jaco Pastorius, Carbonne's interest in jazz became apparent, and he soon pursued the sounds of fretless bass. Over the past twenty years, Carbonne has spent time in private studies with fretless bass virtuoso Alain Caron and former John McLaughlin Trio bass great Dominique Di Piazza. 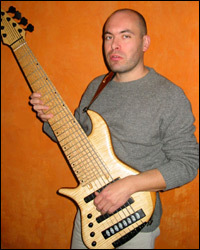 After years of experimenting with various types of basses including 4, 5, and 6-string models, Carbonne conceived a sub-contra bass tuned one octave below standard bass tuning, and today, he researches the various ways of using sub-basses within the context of ensemble configurations, as a soloist, and pedagogically. In February, 2005, Carbonne, Di Piazza, and renowned solo bassist Michael Manring collaborated on an extraordinarily inspiring project for bass trio, duo, and solo repertoire in Talence, France that combines the utilization of unconventional bass playing techniques with funky sub-contra bass grooves, sensitive fretless melodies, and sophisticated chordal explorations. In this interview, Carbonne talks about recording with Dominique Di Piazza and Michael Manring, his theory of sub-basses, and studying with Alain Caron. In May 2005, you released an all-bass recording comprised of solo, duo, and trio arrangements alongside Dominique Di Piazza and Michael Manring. How did this project come together? I have known Michael since 2004. He did a master class at CIAM, a music school in Bordeaux. As I was doing master classes at CIAM too, the director of the school told me that I could meet Michael after his performance. We jammed for two hours, and it went great! I've known Dominique since 1993. After a concert he was playing with guitarist Lionel Benhamou and drummer St�phane Huchard, I asked him if we could jam. We did and after that we became good friends, and I soon began studying with him. He stopped playing bass for awhile, but we always stayed in touch. Dominique also began doing master classes at CIAM in 2004. In spring 2004, Philippe Lissart invited Michael, Dominique, and I to a dinner at his home. After the dinner, we jammed and Philippe said that he wanted to produce a recording of us, and the bass trio was born. Did you, Dominique, and Michael ever perform together as a trio before recording this project? No, the next time we all met after that dinner was in the studio. Since each of you contributed to 4 tracks, how did you, Dominique, and Michael compose the material on this new trio recording, especially since you and Dominique live in France while Michael resides in California? Each member of the trio provided original compositions and ideas. I spent two days with Dominique before the recording, working on both of our tunes, but each composition was spontaneously arranged in the studio. "Sub Jam" is just an improvised jam between Michael and me. We liked it so it became a new tune for the recording. Given that the electric bass has been traditionally recognized as a low frequency instrument, how did you arrange the trio pieces using only three electric bass guitars and still maintain clarity between the instruments? I think that each member of the trio has a very distinctive and clear voice. We had to find the right place for each voice in the trio and duo compositions. With my sub-basses, it felt natural for me to cover the low parts on songs such as "Anticipation," "Sub Jam," "Nuestra Esperanza," and "What's On Her Mind? ", but I also played fretless melodies in the upper registers on "Ever Lasting Love" and "The Bright Morning Star" and guitar-like chords on fretted bass on the tune "Anticipation." I had particular parts in mind for Michael and Dominique in my compositions. In the studio, we have tried several combinations for each trio tune and chose what sounded the best. I spent a lot of time with Pascal Ricard, the great sound engineer of Rock & Chanson Studio, while mixing the project. During the recording process, did everyone have structured charts to follow or was the music captured using a combination of both prepared parts and improvised sections? There were charts but also quite a bit improvisation. We just tried to make music together with no limitations to ideas because I believe that before thinking like bassists, we should think like musicians. Do you, Dominique, and Michael plan on playing any live shows to promote the new recording? Yes! We'll play in Paris at Le Triton on December 3, and we'll also play at the NAMM show in January 2006 in California. Where can the new bass trio recording be purchased? At this time, the easiest method to purchase the recording would be to contact Philippe Lissart at Carbonne-DiPiazza-Manring.com. The recording will also be available through European-BassDay.com and soon in an American-based online music store. Unlike many other extended range bassists who just simply keep adding strings tuned in 4ths below the open E-string such as B, F#, and C#, you actually utilize a unique concept where you tune your basses a complete octave lower than standard tuning. Why did you develop this concept? I've developed this concept because I think it sounds better than continuously adding strings tuned in 4ths below the standard open E-string. The open sub-low E (20.6 hertz) makes a lot of sense to me because if you play with another bassist, you can double his parts one octave lower with the same fingerings and open strings. You have the same thing in a symphonic orchestra between violas, cellos, and double basses. For harmonic purposes, I definitely think that it sounds better. You've taken an active role in the development of sub-contra basses through a partnership with luthier Christian Noguera. Can you tell us about the Yves Carbonne signature series basses you have helped design? The Noguera YC basses are the synthesis of all the great basses I played up to 1998. The best basses I had used up to that time were an F Bass Alain Caron 6-string fretless and a 1973 Fender Jazz bass. I came to see Christian with my drawing and asked him if he could build a bass with my ideas. The result was very unique from what he doing at that time but it was good. Christian builds great instruments, and he was also the first to materialize my sub-bass concept. I am also currently working with Jerzy Drozd. He is an incredibly talented luthier, and he's building me a 10-string fretless version of his Legend X model. I'm very excited about this project because this instrument will have 7 playable octaves, and it will be tuned using my sub-bass concept, starting one octave below standard bass tuning: E-A-D-G-C-F-Bb-Eb-Ab-Db. What do you feel are the greatest advantages to be gained by tuning your bass an octave lower than standard tuning? To me, the greatest advantage of tuning a bass one octave lower is the resulting bigger and warmer sound. The sound is still warm even if I play in a very high register. It doesn't sound exactly the same as a 6-string. It just sounds better, more homogeneous. If you decide to play an extended range bass, you should have a serious idea of what you are going to do with it. The instrument is only the tool and just having more strings in itself doesn't make much sense to me if you don't have the musical ideas. I want more register because I hear music on bass guitar within this register. I don't want to use my instruments only for playing the bass parts. I want to play all that I can hear. In playing an extended range bass tuned an octave lower than standard tuning, what has been the biggest obstacle you've had to overcome? The low strings move very slowly so you have to articulate a lot to get a clean sound. In terms of musical application, how do you use instruments tuned that low within an ensemble context? These very low notes give new directions even for solo applications. In my solo tune "Holy Spirit" on the trio recording, I use the very sub-low E and A strings of my 8-string fretless to create bass pedals with uncommon tones during my improvisation. Playing chords in the medium or high registers of these very low strings also provides a great dark and interesting sound. How do you amplify a bass that has a low string tuned one octave below a standard low E-string? I use an Aguilar DB 728 all-tube power amp. I also use AccuGroove speakers. I have a Whappo Grande with a 21 inch speaker in it. It is a very fast speaker for its size, and it sounds great. It affords me the ability to hear the complete range of my sub-basses. I also use the AccuGroove Tri 210L. It is very compact, powerful, and warm. Where do you find strings that can be tuned that low? Richard Cocco, the president of La Bella strings, has been providing my sub-bass strings since 2002. They are custom Super Steps. I've recently received the sub-low B-string (15.4 hertz). It will be used on a 12-string bass that will be built for me. Who motivated your own approach to playing bass? Jaco Pastorius was my greatest influence on bass, but I think we are all influenced by everything we hear. I try to listen to very different kinds of music. Serge Prokofiev, Igor Stravinsky, Arnold Schoenberg, and Olivier Messiaen are my favorite classical composers. I have a passion for John Coltrane, Miles Davis, Joe Zawinul, John McLaughlin, and I love flamenco music. As a student, you've studied with two of today's most extraordinary electric bassists in Dominique Di Piazza and Alain Caron. What are some of the most significant concepts they have taught you which have contributed the most to the level of musicianship you've been able to achieve as a bassist? Dominique has a unique approach to playing the bass. I've never tried to copy him but seeing him play has helped me to find my own voice. The most significant concepts he taught me were about rhythm and harmony. Alain was an early influence of mine. I met him when I was 17 years old, and I was very impressed with his playing. He taught me great concepts about phrasing and playing melodies. He has a very strong voice on the fretless 6-sting, but I think I have found my own with the fretless 8-string and soon to be fretless 10-string. Do you perform regularly as the leader of your own group or as a sideman with any bands in France? I perform as a leader when it's possible, but I'm also available for sessions as sideman. I play duets with a harmonica player named Laurent Maur. Now that you've recorded a bass trio project with two world-renowned bass players, what other projects do you hope to complete? My main project is my solo album, and I hope to have it finished by the end of this year.